I remember the author from her days as a columnist for the Boston Phoenix. That's kind of why I picked it up, but also because a subset of my longing for a house of my own is wanting to get a dog. The setup -- both her parents die, she gets sober after X number of years of alcohol abuse, she gets a dog. 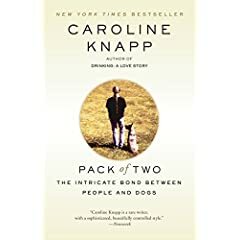 Throughout the book she explores her relationship with the dog and what that relationship means to her at that point in her life. And that's the jumping off point for an exploration of the relationship between people and dogs in general. She's very good at teasing out all the nuances of this relationship. Boy, you can really tell, though, that she spent years in therapy (no, she doesn't sound really messed up -- she's just got this whole different level of awareness about the meaning behind our responses within a relationship -- where they come from, what they might be doing there). She also has some breathtakingly scary stories about dysfunctional people and how their issues manifest themselves through their relationships with their dogs. Very entertaining read, but a little bit more than I was looking to get into, I think.